Chilewich Metallic Lace Tablemat (SET OF 4) or Runner (1) (CWMETALLACE) at Pure Design / Accessories / Chilewich ::: Furniture for the Home, Office, Home Office, and More at Pure Design Online! At first glance, these elegant silver tablemats look like metal, but don't be fooled! 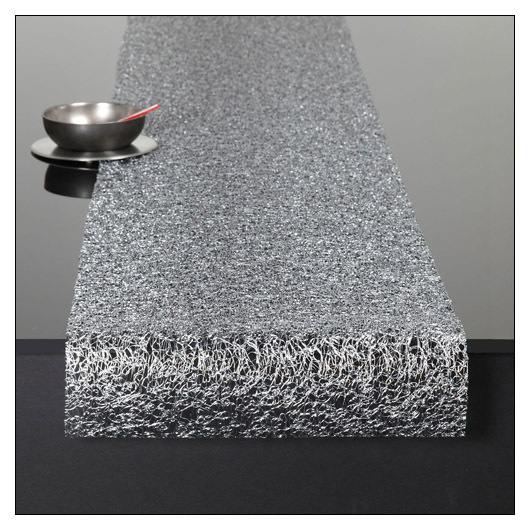 They are the more refined version of the classic Chilewich woven vinyl mat. With a lacy feel, the beautiful Metallic Lace is eye-catching and modern! Sold in sets of four. Table runner is sold separately, for $20 less.